Recent Dell Optiplex “mini tower” models have a space below the optical bays and behind the front panel USB ports for something to be installed. 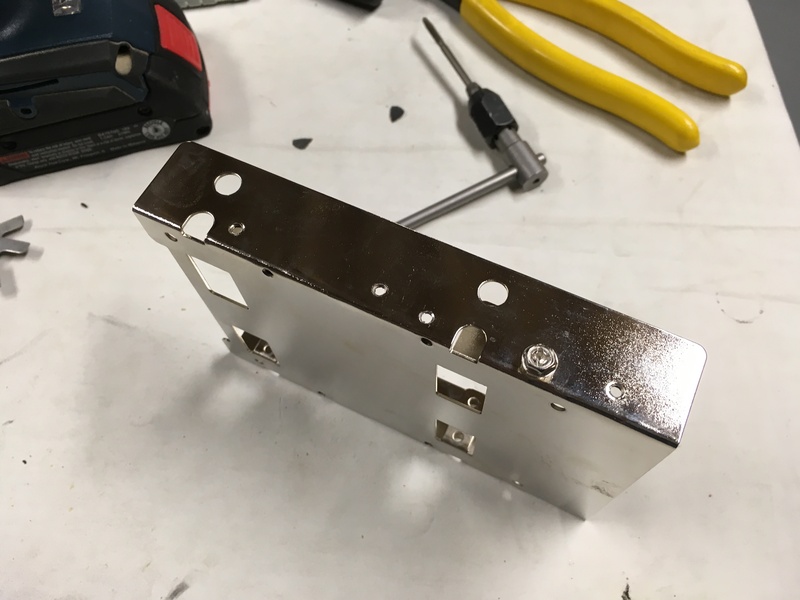 I’m not sure the original intent but there is a bracket that will fit a typical hard drive, although the mounting holes may not match up. These mini tower systems like the Optiplex 9020 or XE2 have two optical bays and two hard drive bays. But they have no specific SSD bays. 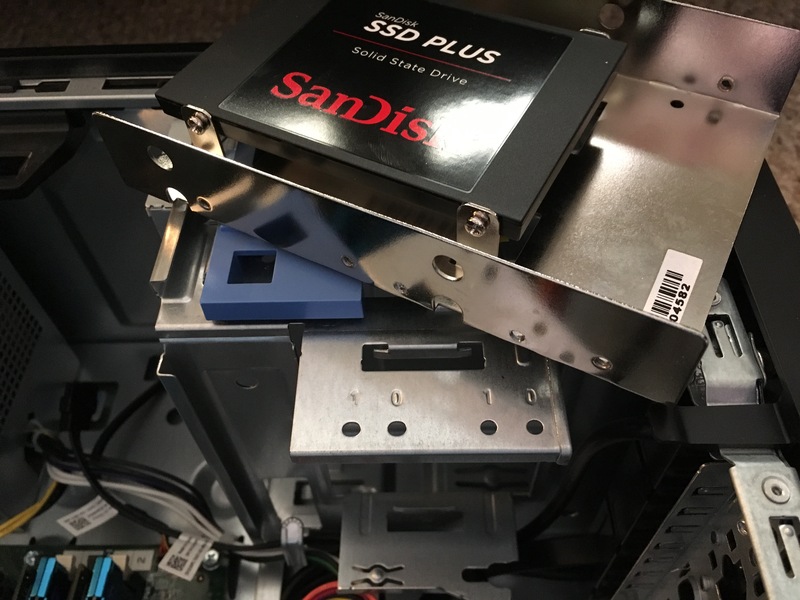 You could get an adapter to fit an SSD in a hard drive bay or an optical bay. But why sacrifice one of those bays when you can put an SSD or two in this found space? First, you are going to need an SDD carrier. 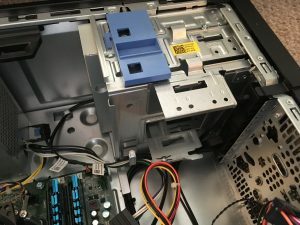 I like the Silverstone adapter that will hold two SSDs but you should be able to use any adapter for holding an SSD in a normal 3.5″ hard drive slot. For tools, you will need a fine point sharpie, a metal punch, a 3/32 (or 7/64) drill bit and drill, and a 6-32 tap. 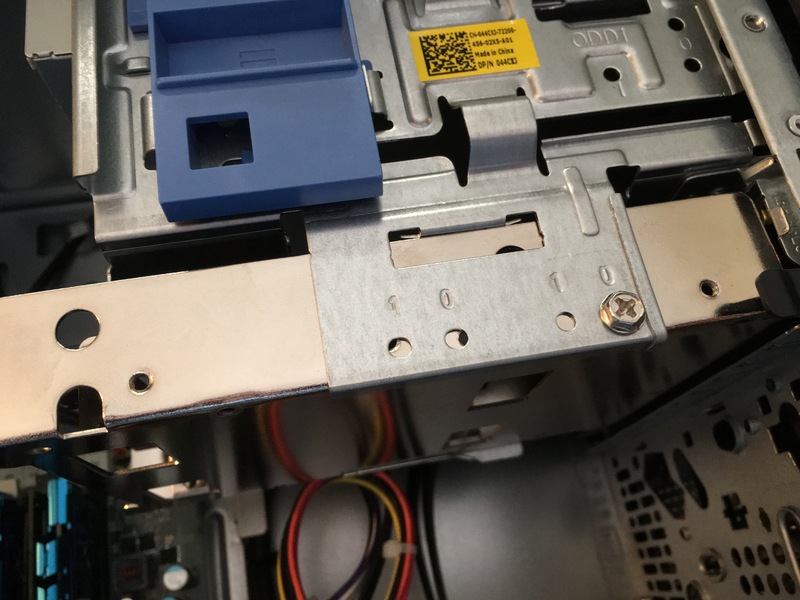 Now slide in the SSD adapter such that when the drives are installed, the back of the SSD will be flush with the back of the adapter. (Not so that the front of the SSD will be flush with the front of the adapter. See picture to match holes.) 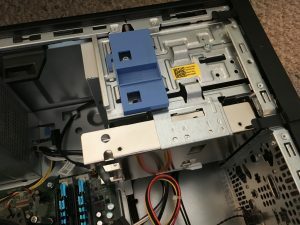 Slide the adapter forward until you feel it sort of click on the other side and make sure that there is about an 1/8″ to a 1/4″ of space between the adapter and the front USB panel – no reason to squish wires. Once in the right spot, use the fine point sharpie to mark the locations of the holes you want to drill. 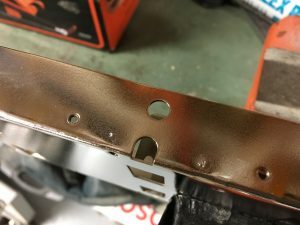 I think two should be fine and I chose the two holes marked with a “0” on the Dell bracket because they were further from any holes already in the bracket. (It’s tough to keep the drill from slipping when drilling near an existing hole.) Here’s a picture with the adapter in the right place and with the holes marked with the sharpie. Take the adapter out of the computer before continuing. (It’s a bad idea to drill and leave metal filings in a computer!!) Here’s a picture of the punch I use. It’s a centering punch, so not ideal for metalwork like this where you can’t see the thing you are punching, but it is still effective. One of the problems is that it has a tendency to wander before you hammer it. 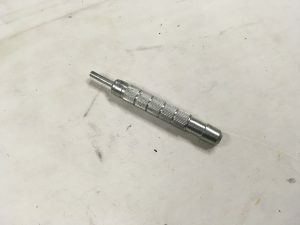 With the adapter held in a vice of some sort, use the punch to make the indentations where you marked with the sharpie. You can see in this picture that I have marked both locations and you can see that the metal is soft enough that even though the punched locations are near the fold where the metal is stronger, the edge away from the punched locations has a bit of a deformation. Easily solved later with fingers by bending back into place. Now drill the holes with the 7/64 drill bit. If you don’t have one of those, as I don’t, use a 3/32 drill bit. Obviously, do your best to keep the drill on target. 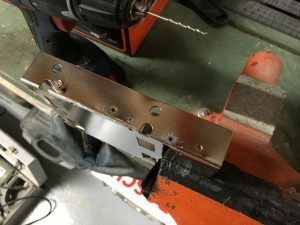 The metal is pretty soft so drilling isn’t too difficult to drill. 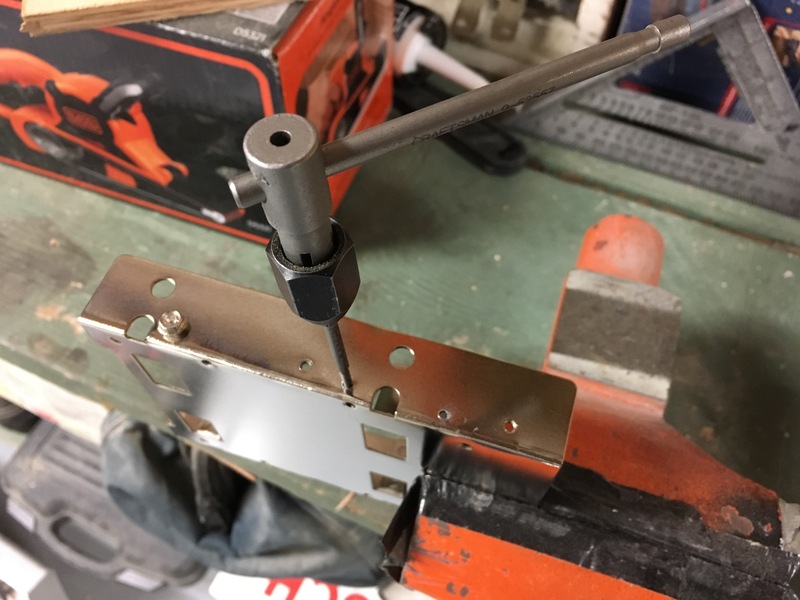 Use the tapping tool and a 6-32 tap to tap the holes. Again, the metal is pretty soft so it isn’t too difficult to tap. It will take a bit more effort if you used a 3/32 drill bit like I did. At this point, try screwing in one of the screws to make sure it will fit. Success! And finally, you can put the adapter in the computer and screw it in place. You can see from my picture here that one of the holes didn’t end up in quite the right place. So I only was able to use one hole at a time. It’s not a big deal, but I’ll be getting a better punch so I can do this kind of thing with more accuracy in the future.